ESRD is a serious public health problem in the state of Jalisco, Mexico. This study evaluated mortality in poor patients who initiated dialysis at the Jalisco Health Secretariat, compared with Hispanic patients without medical insurance who initiated dialysis in the United States. All patients who received a diagnosis with ESRD between February 1 and December 31, 2003, were studied prospectively at a single institution that provides care to the poor of Jalisco. Data from an American national dialysis registry and Cox proportional hazards models were used to compare the adjusted survival among Jalisco patients with that of a contemporaneous group of incident Hispanic patients who did not have Medicare or private insurance cover and who initiated peritoneal dialysis in the United States. Of 274 consecutive patients who presented with a clinical diagnosis of ESRD in Jalisco, mean estimated GFR at dialysis initiation was very low (3.9 ± 2.4 ml/min per 1.73 m2), and <10% were previously known to a nephrologist. Of the 274 patients, 102 (37.2%) did not initiate dialysis therapy, 71 (69.6%) of whom died during follow-up. The majority (n = 49) of such deaths occurred in-hospital before dialysis initiation. Of 172 patients who initiated dialysis, 36 (20.9%) died within the first 90 d of renal replacement therapy. An additional 31 (18.0%) patients died during a median follow-up of 186 d. When all 274 Jalisco patients who presented with ESRD were considered, survival was 49.6% at the end of follow-up. Unadjusted mortality rates among those who survived at least 90 d after dialysis initiation were 19.2 (95% confidence interval [CI] 13.5 to 27.3) and 5.9 (95% CI 4.6 to 7.7) per 100 patient-years in Jalisco and American patients, respectively. After adjustment, the risk for death remained nearly three-fold higher in Jalisco patients (hazard ratio 2.7; 95% CI 1.5 to 4.7). Poor patients with kidney failure in Jalisco have very advanced disease at the time of first nephrologic contact and have exceedingly high rates of mortality after dialysis initiation. Our findings demonstrate a tremendous opportunity to reduce morbidity and mortality from kidney disease in Jalisco and perhaps other regions of Mexico. In the past 60 yr, Mexico has experienced significant economic progress that has been accompanied by major societal change. As in other developing nations, life expectancy in Mexico has increased, and morbidity and mortality as a result of infectious diseases have fallen dramatically. However, these successes have been offset by the emergence of chronic noncommunicable diseases, such as diabetes, hypertension, and chronic kidney disease (CKD), which currently account for 56% of deaths in the general population (1–3). The state of Jalisco is located in western Mexico and has 6.3 million inhabitants, approximately 60% of whom live in the state capital of Guadalajara with the remainder in dispersed urban and rural areas. Unemployment among adults who seek work is low (2%), and annual per capita income is approximately US$6000/yr. The chief employers in Jalisco are the service (31%) and industrial (25%) sectors, with only 11% of adults working in the agricultural industry. Despite this growing economic prosperity, 10% of Jalisco households do not have running water or sewage systems (4). The public health care system in Jalisco (like elsewhere in Mexico) is multitiered and highly centralized. Social security benefits (including access to dialysis) are available to individuals who are employed by corporations or the state. However, such people represent less than half of the Jalisco population, and <2% can afford private health insurance. The remaining 56% do not have access to social security and cannot afford access to private health care services. This segment of the population seeks care at the facilities of the state’s Health Secretariat. ESRD is a serious public health problem in Jalisco and is among the 10 leading causes of death, with an annual mortality rate of 12 deaths per 100,000 population (4). Diabetes is responsible for 56% of incident cases of ESRD in Jalisco, and the proportion is increasing over time (5). The public health care system has been placed under tremendous strain by the epidemic of diabetes and its complications. Although access to predialysis care is almost universal for those with social security benefits, it is severely restricted for the poor (6). Clinical experience suggests that Jalisco patients who have kidney failure and do not have social security benefits present very late to nephrologic services, leading to adverse outcomes. We conducted this prospective study to examine mortality in patients who initiated dialysis at the Jalisco Health Secretariat, compared with Hispanic patients who did not have medical insurance and initiated dialysis in the United States. The Hospital Civil de Guadalajara is a large tertiary care facility that offers dialysis to patients without medical insurance and is funded by the state and federal governments. Unlike the situation in the United States, most Jalisco patients with ESRD start on continuous ambulatory peritoneal dialysis (CAPD). Because of limited resources, hemodialysis is mainly used as a back-up therapy for PD failures. Every patient who is referred for renal replacement therapy (RRT) is presented to a review board that includes a social worker, nurses, and physicians. The patient’s socioeconomic and medical conditions are closely scrutinized, including housing conditions. When needed, recommendations for minor home adaptations are made. Patients are generally initiated on treatment with weekly intermittent PD while being trained for CAPD. Once training is complete and the home environment has been optimized, patients initiate CAPD. Payment for home-delivered dialysis supplies is made in advance by those with sufficient funds (approximately US$180/mo). The cost of treatment is wholly or partially borne by the hospital for patients who cannot afford these charges, and no patient is denied access to dialysis because of inability to pay. All patients who received a diagnosis of ESRD between February 1 and December 31, 2003, were prospectively registered by one of us (G.B.-R.). Patients who had acute renal failure, those who previously underwent dialysis, and those who had received a kidney transplant were excluded from the study. Baseline data that were obtained from each patient included age, gender, cause of renal failure, type of referral (self, physician), referring physician (nephrologist, other), type of admission (emergency, elective), laboratory data (hematocrit, serum creatinine, serum albumin), appropriate or inappropriate housing to permit CAPD, and the presence of a ready-to-use dialysis access. GFR was estimated using the Modification of Diet in Renal Disease (MDRD) study equation (7). Patients who presented for dialysis because of uremic symptoms and without being referred by a physician were considered as “self-referred.” For those who were referred by a physician, the distinction was made between nephrologists and other specialists. “Inappropriate housing” was defined as a house with one or more of the following conditions: Lack of plastered and painted walls, presence of a cardboard ceiling, or lack of an intact window and/or a door. Acute dialysis was defined as the initiation of dialysis using an uncuffed temporary PD catheter. Long-term dialysis was considered to have commenced at the time a permanent, double-cuffed PD catheter was inserted. Vital status was ascertained by data linkage with the Office of Vital Statistics at the state Health Secretariat. We used data from the US Renal Data System (USRDS) to obtain a contemporaneous comparator group of patients who initiated RRT in the United States. This cohort was composed of incident Hispanic PD patients who did not have Medicare, Medicaid, or private insurance coverage and who initiated RRT between April 1, 1995, and October 3, 2001. Because Medicare data availability is inconsistent during the first 90 d of dialysis therapy (8), we restricted analyses that used USRDS data to patients who survived at least 90 d. Baseline demographic and clinical characteristics were obtained from the Identification and Medical Evidence portions of the Renal Beneficiary Utilization System of the Health Care Financing Administration. The date of death for deceased patients was obtained from the Renal Beneficiary Utilization System Identification and Death Notification Files. Survival time was defined for all participants by the period beginning 90 d after dialysis inception and ending at death. Follow-up was censored in all participants at 1300 d, loss to follow-up, or renal transplantation. We individually examined the association between region of treatment (United States versus Jalisco) and other factors on survival after dialysis inception using Cox proportional hazards models. We then determined whether these associations were statistically independent of other factors using multivariable Cox models that included variables that showed an association (P < 0.1) with survival in univariate models. Factors considered included age, gender, diabetic status, smoking status, weight, hematocrit, serum creatinine, and serum albumin (all at baseline). We determined that the proportional hazard assumption was satisfied by examining plots of the log-negative-log of the within-group survivorship functions versus log-time as well as comparing Kaplan-Meier (observed) with Cox (expected) survival curves. Adjusted survival curves were produced using the mean of covariates method. Statistical analyses were performed with SAS software version 8.2 (SAS Institute, Cary, NC) and Stata software version 8.0 (Stata Corp., College Station, TX). This study was approved by the institutional review boards at the Hospital Civil de Guadalajara and the University of Alberta. Of 274 consecutive Jalisco patients who presented with a clinical diagnosis of ESRD, the average age was 49.1 ± 18.4 yr, and approximately 85% were admitted through the emergency department. Residual kidney function at dialysis initiation was very poor (mean estimated GFR 3.9 ml/min per 1.73 m2), and severe metabolic acidosis, anemia, and abnormal calcium-phosphate metabolism were common. Fewer than 10% of patients were previously known to a nephrologist, and only seven (2.6%) had estimated GFR >10.5 ml/min per 1.73 m2 at dialysis initiation. Of 274 Jalisco patients with ESRD, 102 (37.2%) did not initiate dialysis therapy. Of these, 49 (48%) died in hospital before dialysis was initiated, 35 (34.3%) chose not to initiate dialysis, and 15 (14.7%) were not considered suitable for dialysis because they were moribund (n = 2) or lacked appropriate housing or family support (n = 13). An additional three patients transferred to another facility. Patients who initiated dialysis were more likely to be younger; more likely to be female; and had slightly less abnormal levels of serum phosphate, bicarbonate, and albumin than patients who did not initiate dialysis (Table 1). Among Jalisco patients, markers of socioeconomic deprivation were common. However, within the population studied, there was no relation between socioeconomic characteristics and the likelihood of initiating RRT (Table 2). Of those who did not initiate dialysis, 71 (69.6%) of 102 died during follow-up. 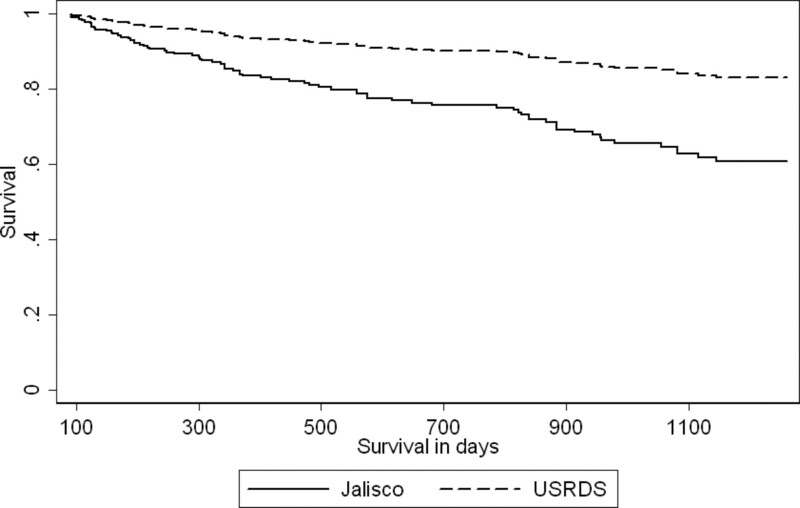 Of the 172 patients who initiated dialysis in Jalisco, 36 (20.9%) died within the first 90 d of RRT. An additional 31 (18.0%) patients who survived this period died during follow-up. After a median of 186 d of follow-up, 19.8% of patients had died (unadjusted mortality rate 11.0 per 100 patient-years; 95% confidence interval [CI] 6.8 to 17.7) among patients who initiated dialysis treatment. When all 274 patients who presented with ESRD were considered, survival was 49.6% at the end of follow-up. We restricted these analyses to the 106 patients with at least 90 d of follow-up time on dialysis, excluding those who died within the first 90 d or had <90 d of follow-up at study end. In these analyses, treatment in Jalisco was associated with similar demographic characteristics (including age and the likelihood of diabetes) but much poorer residual renal function, lower serum albumin, and more severe anemia at dialysis initiation than treatment in the United States (Table 3). After a median follow-up of 865 d, survival in this group was 70.8% in Jalisco patients and 86.1% in American patients (P = 0.001). Unadjusted mortality rates were 19.2 (95% CI 13.5 to 27.3) and 5.9 (95% CI 4.6 to 7.7) per 100 patient-years, respectively. After adjustment for age and gender, the risk for death after dialysis initiation remained approximately three-fold higher in Jalisco patients than in American PD patients of Hispanic descent (hazard ratio [HR] 3.2; 95% CI 2.1 to 5.1) and was similar in the fully adjusted model (HR 2.7; 95% CI 1.5 to 4.7; Figure 1). Adjusted survival of patients who initiated peritoneal dialysis in Jalisco compared with patients who were treated in the United States. The figure shows survival among patients who survived on dialysis for ≥90 d, after adjustment for age, gender, body weight, diabetic status, hematocrit, serum creatinine, and serum albumin. We first performed sensitivity analyses to compare the Jalisco patients with subsets of the 409 USRDS patients who were studied in the primary analysis. Restricting analyses to compare the 106 Jalisco patients with only the 252 American patients with GFR <6 ml/min per 1.73 m2 at dialysis initiation obtained similar results to those in the primary analysis (adjusted HR 3.0; 95% CI 1.5 to 6.1). When the subset of 228 American patients who initiated PD in calendar years 1999 to 2001 was studied instead, results remained similar (adjusted HR 3.2; 95% CI 1.4 to 7.3). Because PD patients are a relatively select group in the United States, we performed an additional analysis that compared mortality in Jalisco patients and all Hispanic USRDS patients who did not have medical insurance and survived at least 90 d after dialysis initiation, regardless of dialysis modality. Mortality remained significantly higher among Jalisco patients in this analysis (HR 3.5; 95% CI 2.4 to 5.0). Patients who are treated for kidney failure at the Jalisco Health Secretariat are unlikely to receive predialysis nephrologic care and have very severe metabolic derangements at the time of dialysis initiation. By American standards, dialysis was initiated very late in this group of patients, and only 2.6% had estimated GFR >10.5 ml/min per 1.73 m2 at dialysis initiation as recommended by US guidelines (9). Probably because delayed presentation was so common, nearly 20% of patients died in hospital before dialysis could be initiated, and an additional 13% (21% of those who initiated dialysis) died within the first 3 mo of treatment. Even after exclusion of the relatively high proportion of patients with early death, adjusted survival of dialysis patients who were treated in Jalisco was substantially lower than in seemingly comparable patients who were treated in the United States, perhaps because of their advanced disease at presentation. An additional 18% of patients did not initiate dialysis for various reasons, leading to death from uremia in the majority. Although choosing not to initiate dialysis may well have been appropriate in some cases, it is possible that some patients would have chosen differently with adequate time to prepare for RRT. BP reduction (10), tight glycemic control (11), interruption of the renin/angiotensin system (12,13), and possibly treatment of hypercholesterolemia (14,15) all delay or prevent progression of CKD and reduce cardiovascular morbidity and mortality. Timely nephrologic care may permit introduction of these proven therapies as well as dialysis access creation and control of metabolic bone disease and anemia (using low-cost therapies such as oral calcium carbonate and iron) (16–22). Although earlier referral to nephrologic services would probably have improved outcomes in the Jalisco patients, this will require specific resource allocation and recruitment of additional nephrologists. For instance, currently 10 dialysis programs (staffed by 31 nephrologists) provide care to beneficiaries of Social Security but only three programs (nine nephrologists) in the Health Secretariat facilities. All three of the dialysis facilities that are run by the Health Secretariat are located centrally in Guadalajara, despite that many of the poor reside outside the state capital. Although we did not collect data to confirm our impression, clinical experience suggests that (with the exception of insulin and oral hypoglycemic agents) medication use at presentation among the patients in our study was exceedingly rare. This suggests that multipronged interventions that target multiple cardiorenal risk factors in patients with CKD have considerable potential to improve health in Jalisco by delaying or preventing kidney failure and perhaps by reducing the burden of comorbidity at dialysis initiation. Although recent articles highlighted the growing burden of kidney disease in developing nations as a result of globalization and other factors (23–27), most have focused on whether provision of RRT is possible or cost-effective in this setting. Our study demonstrates that funding dialysis services is associated with very poor clinical outcomes in the absence of therapies that aim to prevent progressive kidney disease and its complications. These data support current initiatives by the International Society of Nephrology and other organizations that target low-cost therapies for prevention (rather than treatment) of kidney failure and its causes (28–30). Our study has several limitations that should be considered. Although data were prospectively collected according to a priori definitions, they were obtained from a single institution and therefore may not be generalizable to all low- or middle-income settings. Second, because of widely known limitations of the USRDS registry (8), we were unable to compare mortality in Jalisco patients within the first 90 d of dialysis treatment with that experienced by patients who were treated in the United States. Data on early death in Americans with ESRD are sparse, but available studies suggest that the proportion of incident patients who die within the first 3 mo of treatment ranges from 6 to 12%—substantially lower than in Jalisco. Therefore, this limitation is unlikely to have affected our conclusions (31–33). Third, <20% of incident patients in the United States initiate RRT on PD, raising the possibility that the seemingly better outcomes compared with Jalisco patients (all of whom were treated with PD) are due to selection bias. However, results were similar when American hemodialysis patients were included in the comparator group, making this possibility less likely. Fourth, the US patients were selected from a slightly earlier calendar period than the Jalisco patients. However, we believe that this is unlikely to have affected our outcomes because mortality rates among US dialysis patients have remained relatively constant during this period. Fifth, the MDRD equation may not perform well among Hispanic patients or those with kidney failure; therefore, conclusions related to the precise level of GFR among the patients in our study should be viewed with caution. However, because all patients in the study were of Hispanic origin, this is unlikely to have led to bias. Finally, although Jalisco patients without social security or private insurance are unlikely to have received care for kidney failure at other institutions, we cannot exclude the possibility that some died without seeking any medical attention. Therefore, our results probably underestimate mortality as a result of kidney failure among the poor of Jalisco. We found that poor patients with kidney failure in Jalisco have very advanced disease at the time of first nephrologic contact and have exceedingly high rates of mortality after dialysis initiation. Our findings demonstrate a tremendous opportunity to reduce morbidity and mortality as a result of CKD in Jalisco and perhaps other regions of Mexico. This study was funded by a grant from the Foundation of the Civil Hospital de Guadalajara. The sponsor did not participate in analyses or influence the decision to submit for publication. M.T. was supported by a Population Health Investigator Award from the Alberta Heritage Foundation for Medical Research and by a New Investigator Award from the Canadian Institutes of Health Research. Data on patients from Jalisco who died after loss to follow-up were provided by Teresa Garcia, Office of Vital Statistics, Secretaria de Salud (Jalisco, Mexico). See the related editorial, “Renal Replacement Therapy in the Developing World: Are We on the Right Track, or Should There Be a New Paradigm,” on pages 1635–1636.